Genuine leather sofas are incredibly stylish furniture items. They look gorgeous in the variety of interiors, and they are usually very durable – unless they are made of faux leather, of course. However, genuine leather furniture is also very expensive, and even though it may become a part of any interior, it is quite demanding in terms of interior arrangements. So, before you even start looking at leather sofa selection, it is advisable to consider several aspects – they will help you to define whether your living room will benefit from the purchase. Plus, they will definitely help to narrow down your search parameters and find the perfect match for your interior sooner. Leather sofa can become a part of both traditional and contemporary interiors. However, their exquisite look will be only be truly revealed in the modern styled rooms. So, you will have to take your time to consider the entire living room arrangement. Think of the furniture you will need to match the sofa. Think if your space allows it – leather sofas look especially stylish in the spacious rooms. Think if you need a regular leather sofa or a curved one. 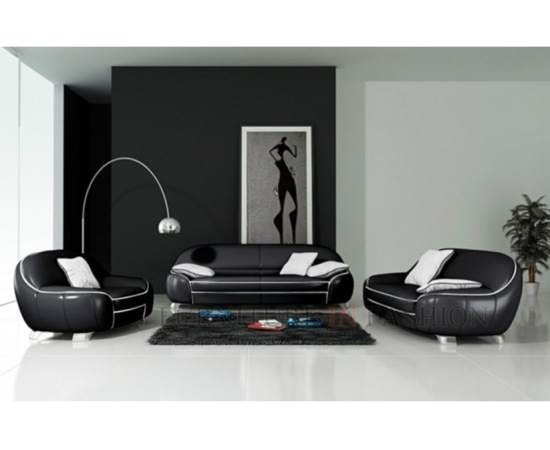 Sectional sofas look simply amazing in leather. However, if a standard sofa is a relatively compact and interior neutral arrangement, a curved one requires a lot of space. Sure, it is more stylish – but sometimes you have to work with a limited size room – there is no escaping that. Leather sofas come in many colours – it is possible to find even the wildest ones in stores. However, even despite leather durability, it is still possible to damage it incidentally. Just in case you might have to repair the cut, you should probably stick to neutral colours – they are easier to repair and re-dye. It is important to stress the urgency of looking for genuine leather. Faux leather is not a durable material, and if you tear it, you will have to change the upholstery completely. This is not the cheapest thing to do on a regular basis. Big stores often feature sales and discounts, so you might get a chance to save plenty. Plus, bigger stores normally have a more affordable pricing policy than the smaller ones. And, of course, model selection is much bigger, too – so you will find models you need sooner. Finally, do not buy a sofa unless you are 100% confident that you have found the model you need. Genuine leather sofas are quite expensive, so you have to be completely certain that the investment is worth it. Given the high durability of an average leather sofa, it is highly probable that a sofa like that will stay with you for decades. It is really hard to damage, and the leather does not tarnish over the years. You might have to re-dye it from time to time, but not very often – every ten years or so.